Welcome back to the deep Sahara! I thought we'd take a plunge into a rather obscure unit in the raiders' war: the Sudan Defence Force. Coming off the bat from the Free French, the Sudan Defence Force (or SDF) is even more difficult to find information on. So I thought I'd compile some information here as well as quickly talk about how to field them in Flames of War. The SDF was formed in 1925. It was the Sudan's primary defence unit during the era. There is a lot of information and story leading up to 1925, and rather than cover all of that here, I recommend you have a quick google of the history of the Sudan. I assure you its all good stuff and pretty intriguing in its own right! The Sudan itself was effectively divided into two sub-states, the Muslim north and the Christian south. To avoid religious problems, the British established the SDF based on regional boundries. This also helped foster a bit of comradeship between the troops since they were familiar with each other, spoke the same dialects, and held the same beliefs. Sudan Camel Corps. ('the Hajana'). In addition, the Sudanese Frontier Force battalion was established during the war when the SDF expanded in 1939. 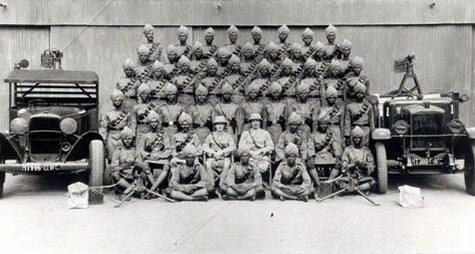 All officers and senior NCOs were British, but their ranks were referred to in the equivalent Sudanese ranks (actually based on Egyptian ranks, which in turn were based on old Ottoman ranks). The battalions oversaw the security of the country, and would be called upon to defend against Italian actions in east Africa. Many battalions were fully motorised and some included Motor Machine-gun Companies. These highly mobile units were essential to the defence plan, being able to rapidly move to counter any incursion. The SDF played a vital role in the battles of East Africa, and once again, I encourage you to spend some time and have a read about this fascinating campaign. It's well worth it and features some interesting characters, such as Orde Wingate. For our purposes, I'm going to concentrate on the Western Arab Corps since it is more directly lined to the story of the Saharan campaign. The battalion's base of operations was Darfur and it was responsible for the entire Northwestern Frontier adjacent to Libya, Egypt, and Chad. Given the region they were tasked with guarding, the battalion was fully motorised and afforded two of the SDF's six Motor Machine-gun Companies. The battalion knew that the Italians in Kufra would be their greatest threat in the event of war. In fact there had been a political crisis in the early 1930s when the British and Italians very nearly went to war over a tract of disputed land in the middle of the Sahara called the Sarra Triangle. This chunk of land was left over as the European countries carved up Africa in the decades prior. What was left was large parts of modern Libya, Egypt, Chad, and the Sudan. It held a very small number of wells and that was about it. But the Italians wanted to link Libya with their holdings in East Africa, so bit by bit, they laid claim to what they could. Fortunately cooler heads prevailed in 1934 and the Sarra Triangle was ceded to Libyia, albeit in a state a lot smaller than the Italians had wanted. 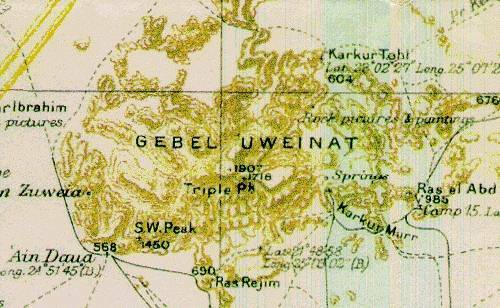 The main point of contention in the whole affair was the location of Jebel Uweinat. It's modest water supply lies directly between Kufra and Darfur, and it didn't take a genius to see that whoever owned the Jebel would have access to not only the Sudan, but the Nile itself. As the politicians argued and the military leaders rattled their sabres, the SDF was sent out of Darfur to occupy the Merga Oasis. The oasis was firmly located within the Sudan, 221 miles southeast of Uweinat, but the Italians had claimed it as well, citing the fact that the Sudan wasn't doing anything with it and it was in the middle of nowhere anyway. In fact, the Italians had sent out an armed (reportedly to guard against bedouin raiders) expedition to the area. So the SDF dispatched two Motor Machine-gun Companies to establish a permanent base at the Merga Oasis under the command of F.G.B. Arkwright. As mentioned earlier, the SDF played an important part in the East Africa campaign. There are several excellent sources on this campaign, and once more I encourage you to explore them if you are interested in the battles of East Africa. However, after all of the bravado and bragging, the war was strangely quiet in the northwestern frontier. 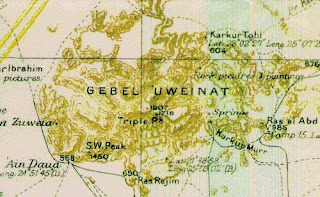 The Italian officers and exploreres who had a decade before been so bold in the Jebel Uweinat area, had been transferred to East Africa, leaving the Italian garrison at Kufra lethargic and unable to go on the offensive. mark out the path from Wadi Halfia to Kufra. The Western Arab Corps used the time to build itself up, should the Italians push into the Sudan. 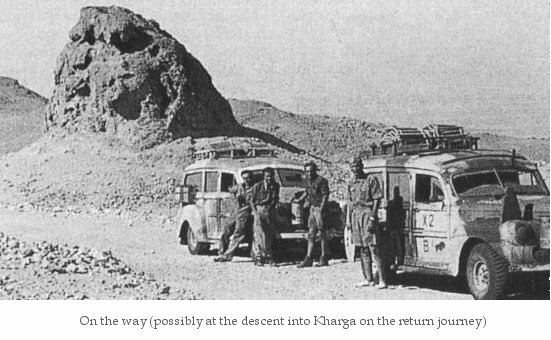 Events moved forward under the direction of the LRDG and the Free French and soon Kufra was removed as a threat. However, a serious problem of supply instantly sobered the thrill of success at Kufra. The solution was already gearing up in Darfur. 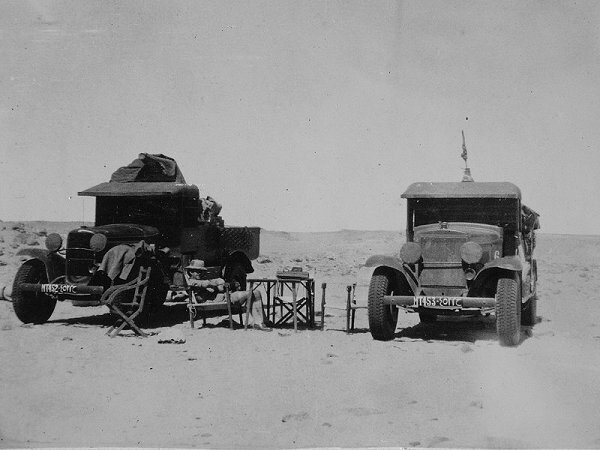 The Western Arab Corps organised a massive supply convoy from the Wadi Halfia on the Nile River Valley to Kufra, over 600 miles to the west. The SDF gradually took over the garrison duties at Kufra, freeing up the LRDG and Free French to conduct offensive operations in the region. The Sudan troops also garrisoned a few outposts as far south as Tekro in Chad and the outlying oases near Kufra. While on garrison duties, the SDF became the main search and rescue force based in Kufra using their exptensive motor capabilities. 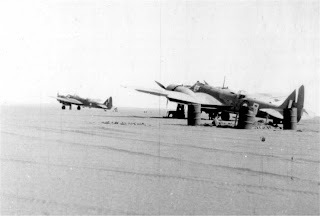 They launched several missions to locate the lost crews of a doomed South African flight of Blenheims, operating close with the LRDG and the Royal Air Force. The SDF also performed counter-espionage operations. In 1942, the SDF became alerted to Count Lazlo Almasy's attempt to smuggle German spies into Cairo via the deep desert. 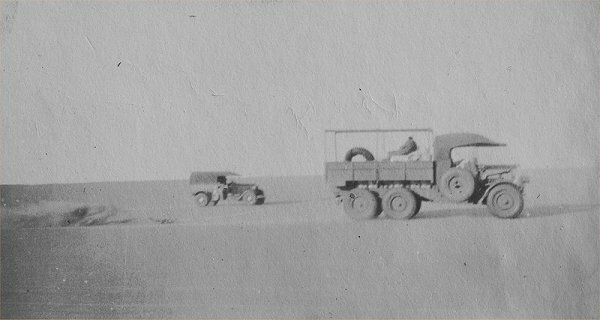 They launched several expeditions and set up many outposts in the Jebel Uweinat area where Almasy was known to be heading. After a major cat and mouse mission, Almasy slipped passed the SDF and returned to Tripoli, having successfully inserting the spies. However, the German spies were quickly found out and captured shortly after arriving in Cairo, but that's a whole other story! In September 1942, the SDF was called upon to make its first and only offensive attack in Libya during Operation Agreement. The plan was to infiltrate several special forces into Axis-held Tobruk and ruin it completely for supply and shipping. The SDF was sent to secure the Jalo Oasis, which would serve as the attack force's rendezvous point. Unfortunately, the operation was completely known to the Germans, thanks to loose security, and Jalo and Tobruk were put on alert. The SDF put up a brave fight at Jalo, but were ultimately repelled by well prepared defenders. The SDF returned to Kufra for the remainder of the North African campaign. I have plans to actually do some modelling articles, like I did for the French, but for now lets have a look at the force in the game. You can find the SDF in Burning Empires on page 138. It looks and acts moreorless like a standard British Rifle company. It has plenty of machine-guns and troops. It can be supported by the LRDG and it has the option to take a desert fort, a quite cool piece of terrain! 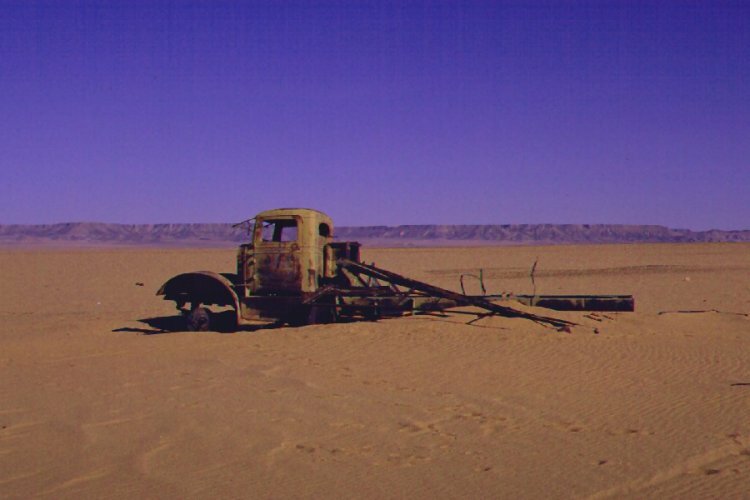 It may not look like much, but the SDF is ideally set up for desert garrison duties. Its not burdened by lots of heavy equipment but it still packs a punch with up to eight machine-guns! Remember, these can also fire bombardments, so you can nail enemy raiders well before they can close in. The Desert Fort is a massive fortification, which will help protect your garrison from the elements and enemy bullets. Use it wisely, and you'll be extremely difficult to shift out of your positions. The LRDG provides you with a small mobile asset, which you can use to intercept enemy invaders and weaken them before they come under the sights of your HMGs. The Transport Section is there in case you want to go mobile, or re-enact some of the SDF's active duties, such as chasing Almasy or going after Jalo. Going back in time, the only thing I'd change about this list is to make the HMGs portee, to reflect the Motor Machine-gun Company, but in so thinking there might be some merit in focusing on those companies as a new support PDF if I get some time to work on it! Anyway, that's about it for now. Have a look at Burning Empires and familiarize yourself with the SDF. They are a fascinating force that often gets overlooked in the tale of the Sahara. Hopefully I'll be able to get a few articles on building the force together in the next few months on how to model them, starting with the infantry. Until then, enjoy this YouTube video of the SDF on parade! Awesome mike, thanks for all your hard work. 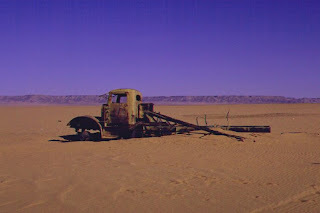 I've just read the "THE TRAGEDY AT KUFRA" i'm feeling a bit deflated now. I was web surfing for some pics on the SDF and came across this. Awesome - my grandpa was in the SDF, and he used to tell me a lot of stories about his days in it when I was a kid (fought first in the reconquest of Ethiopia, then in the Sahara - distinctly remember him talking about Kufra). He was in the one of the motorized machine gun companies - for all I know, he might be one of the folk posing in that pic here. That's great! Thanks for stopping by! I'd be interested in any information about your grandfather's experiences. Its really hard to get information about the SDF, so anything would be extremely valuable! Thank you for putting up this info. Yeah, I can share what info I remember - what's the best email for contact, that ScaryBiscuitsStudios one? Yes, that's the one. Thanks very much and I look forward to hearing from you!